By Leslie J. Pollard Sr.
African American physicians began arriving in post Reconstruction era Augusta, Georgia during the mid-1880s. Initially these black physicians were offered work at the city’s only African American public hospital, but as racial prejudices hardened, they were barred from practicing at public hospitals, thus limiting their access to continuing education, denying career advancement, and creating an environment of discrimination and exploitation. However, black physicians persevered and played a critical role in developing cultural change within the field of medicine through racial solidarity and institutional development. Leslie J. Pollard Sr. was the Callaway Professor of History at Paine College in Augusta, Georgia. His works include “Complaint to the Lord: Historical Perspectives on the African American Elderly” published by Susquehanna University Press in 1996 and Growing up Country, a fictional account of a rural black family during the Jim Crow period. 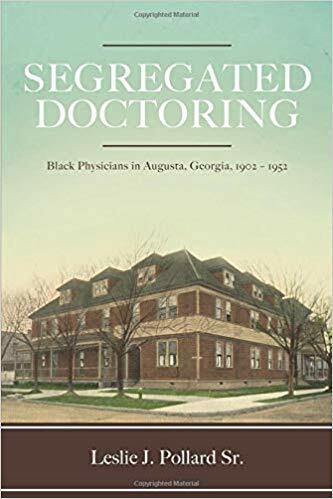 Segregated Doctoring by Leslie J. Pollard, Sr. Articles by: Leslie J. Pollard Sr.